Mr. Kofi Gane, a son of the land, has a unique blend of local, regional and international experiences that are crucial to Ghana’s needs today. He is an International Development expert with vast experiences managing global innovation and development funds, meaning he understands how the world and development works and how to strategically position Ghana within it. 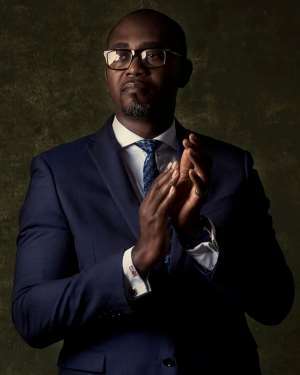 His background as a Chartered Certified Accountant means his professional grooming brings to bear accountability, value for money and critical thinking – the very pillars needed in Ghana's current leadership. Mr. Gane is not tainted by Ghana's political system and as such, he brings refreshing creativity, inclusiveness, and objectivity to how politics is done, as well as the political willpower to challenge and change faulty status quos devoid of blind party allegiance. He admits both our educational system and economy need radical policy innovations to create new opportunities by releasing the full potential of Ghana’s human resource. He believes the solution to our development, lies in Ghana's youthful population, if well-equipped, motivated, then directed. He is a passionate Ghanaian with high integrity, a balanced Christian and respecter of all faiths and creeds. In his own words: "Our generation is a bridge – the only remaining bridge between the truncated dreams of our forebears and the eager hopes of posterity unborn. WE have no choice but to disrupt every faulty status quo and make Ghana work for ALL of us. It is a grave burden that will demand more from all of US collectively. God has indeed blessed our homeland Ghana. It is WE, who MUST now make her Great and Strong." Marricke Kofi Gane's message to Ghanaians is simple - "I am here to put Ghana first, because GHANA deserves better! Because YOU deserve better! Because WE deserve better." His call is to every well-meaning Ghanaian to join this paradigm revolution, so together we can create a fitting inheritance for our future generation, unleash the best Ghanaian in all of us and build the Ghana that is indeed "Great and Strong." Bring your time and expertise to volunteer, bring your finances to support, bring your votes to back a good cause and bring your influence to steer a new order.